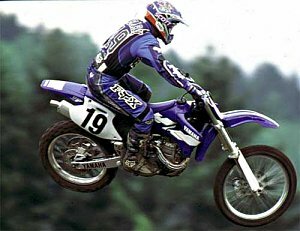 If you haven't thrown a leg over a YZ400F and taken one for a ride then you don't know what you're missing. MX Racer magazine said, "Yamaha has changed the future of motocross." Cycle World added, "The YZ400F is in a class of its own; it relegates pretty much every other off-road Thumper to farm-implement status. 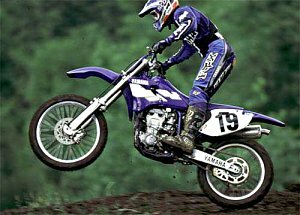 We used to be scared of a four-stroke motocross future. Not anymore." And if that wasn't enough, Dirt Rider named the YZ400F their "Bike of the Year." With all this praise and acclaim, why change? ? To stay one or two turns ahead of the competition. 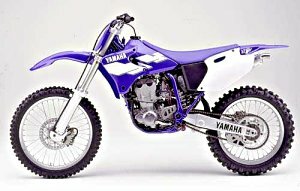 That's why the '99 YZ400F is even lighter in weight! And that weight reduction immediately translates into improved handling and an even higher level of performance. Handling improvements can be traced to a new, lighter swing arm plus, the linkage ratio has been modified.You'll even find there's a larger rear disc brake for outstanding stopping performance. The '99 YZ400F also has a lighter weight rear hub and now comes standard with Excel rims.These new rims and rear hub help reduce unsprung weight, contributing greatly to the handling. This revolutionary four-stroke is powered by a liquid-cooled 399cc, 5-valve, dual-overhead cam, dry-sump engine. It actually delivers more horsepower than 250cc 2-stroke machines! The beauty and attraction of this engine is the way it delivers the power. It has an incredibly broad powerband. Less rear wheel spin translates into rapid acceleration, so you clear jumps right out of the turns and the four-stroke power helps you skim over the whoops more quickly than two-strokes. And because the YZ400F's tractable power is readily accessible, you can ride a variety of lines and pass riders on the inside or the outside of turns. And while the growl is pure four-stroke, the profile is actually narrower than some two-strokes. The YZ400F's quick-steering YZ chassis and "works-style" suspension help you turn all that power into faster laps with less effort. Plus the YZ400F is eligible for contingency in one of the largest programs in the industry. Just one year ago, everyone said it couldn't be done. We not only did it, we came back this year and did it even better. 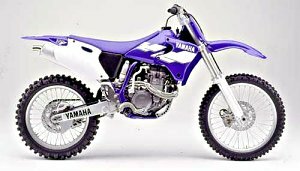 85.3 x 32.2 x 50.6 "
The '99 Yamaha Motocrosser YZ400F is a machine that takes as its base the '99 production motocrosser YZ400F and adds modifications aimed at increasing engine performance, running performance and overall competitiveness in the 500 cc class of the World Motocross Championships and the AMA Supercross/National Motocross Series. This model adopts a liquid-cooled, 4-stroke DOHC 5-valve single cylinder engine developed around the themes of compactness, light weight and high power that, in combination with further matured '99 model chassis, delivers outstanding running performance, handling stability and reliability. In order to achieve performance to enable it to compete on par with the 1) the large-displacement machines of the other makers competing in the 500cc class of the World Motocross Championships and 2) the competitiveness and performance advantages to compete against the 2-stroke 250cc machines in the AMA Supercross and National Motocross Series, this model has been designed with optimum lightness within the regulation limits and performance characteristics to meet the conditions of the various competition courses. Designed with optimum lightness within FIM and AMA regulation limits, this model strives for the highest level of performance as a modified production model based motocrosser capable of competing on par with the factory machines of the other manufacturers competing at the highest-level competition categories.